Social media managers and marketers experiment with new ways to reach their audience through personalized content. By tailoring your content to a specific group, you’re better able to engage customers and create brand loyalty. A popular strategy today is incorporating pop culture references and social media slang into everyday communications with target audiences. While this tactic can create memorable social media moments, it can also be a major flop. From character limits to acronyms and emojis, the Internet—and social media in particular—has had a clear impact on language. Words like “selfie” and acronyms like “FOMO” have become commonplace in our daily discussions. Texts and Tweets are littered with abbreviations and emojis. And even punctuation like the period, question mark or exclamation point have hidden meanings. We covered a lot of social media acronyms in an previous article, so we’re focusing more on the words and phrases that make up today’s social media lexicon. We’re probably missing about at least a dozen, but these are some of the more popular slang terms you’ll come across today. Clickbait: Using a provocative title in order to generate clicks. Cray: Another term for crazy. Crush it: Used to express when someone is doing particularly well or exceeding goals. Fam: Describes someone or a group of people you trust or consider family. Fire: When something is exceptionally good or on point. I can’t even: Indicates the speaker’s inability to speak as a result of being overjoyed or frustrated. Savage: Describes someone or something that is exceptionally brutal or harsh. Slay: Similar to “crush it,” it’s an act of doing something exceptionally well. Slide into your DMs: Describes someone randomly messaging another on Twitter Direct Message. Squad goals: An aspirational term for what you’d like your group to be or accomplish. Thirsty: Describes someone who is too eager or desperate. Throwing shade: To publicly denounce or disrespect someone. TFW: Stands for “that feeling when,” which is commonly used for memes or expressions around a certain event. Trendjacking: Describes when a trending topic is taken over with irrelevant content from other users. Yaaaaaas: When a simple “yes” won’t do to express excitement. Pro tip: Use as many A’s as necessary. One of the best ways to reach a particular group of people is to make your messaging relatable. But in order for social media slang to be successfully worked into your outreach strategy, you need to know who you’re talking to. If you’re a B2B company, this might not be the right time to work “throwing shade” into your vernacular. Today many marketers focus on reaching one of the most studied generations in history: millennials. There are 83.1 million millennials in the US alone, and you bet they’re dominating social media demographics. If this is your target audience, then this is where injecting some social media slang can give your content strategy an edge. This is really important because your brand’s voice is an expression of your company values. It sets you apart from your competitors and helps build trust with your customers. You definitely want to show off your brand’s personality, but it has to feel authentic and genuine. If your business doesn’t regularly have a laid-back or quirky conversational style like Hamburger Helper, then using social media slang terms won’t feel natural for you or your audience. It can come across as if you’re trying too hard or, even worse, that you don’t really know who’s your audience. Either will have the exact opposite effect than what you’re trying to achieve. Developing your brand’s voice is no easy task. You want to remain authoritative yet warm and respectful, but also somewhat cheeky. You need to decide early on what type of tone you’ll establish. Formal language is used to demonstrate a sense of professionalism. It represents respectfulness and authority. On the other hand, it can come across as dry, stiff or lacking in personality. Informal language is whimsical, unstructured and full of personality and warmth. But it can also come across as unprofessional or disrespectful. You have to find a balance, but more importantly, you must remain consistent. Could you imagine the response if one day Goldman Sachs worked #cray into one of its Tweets? It would feel much more out of place than if Denny’s, known for its quirky social media presence, included it. Yes, slang helps marketers relate to consumers on a more personal level by giving your message a conversational tone. But if your brand’s voice is very formal, then it’s best to stick to the messaging parameters decided upon by your team. If you choose to use social media slang, know why you’re doing it. There should be a reason behind everything you do on social media. Don’t start using slang because everyone else is doing it. Again, your brand’s voice won’t feel authentic and it can make it look like your trying too hard. This Tweet from Starburst used #SquadGoals to announce its new FaveREDS candy bag. While it’s not a terrible use of the phrase, it’s not as powerful of a message as the one featured in this Tweet, which uses the same hashtag, from the LA Kings. A while back, “bae” (which ‘means before anyone else’) was the flavor of the week. Many brands tried to work it into their social media outreach, but it just ended up feeling forced. The backlash hit when the Twitter account @BrandsSayingBae was created to call businesses out for jumping on the social media slang trend. Social media slang, much like Internet memes, tends to have a short lifespan. What’s currently trending will soon be taken over by something else. It’s not uncommon for something to be crushing it one week only to fizzle out the next. These words and phrases tend to level off after periods of high adoption. Slang is best when a smaller group of people are using it. When social streams are oversaturated with these terms, it can signal to the original group behind it that it’s time to move on. For example, “bae” replaced “boo,” a popular word describing a significant other in the 1990’s and 2000’s. 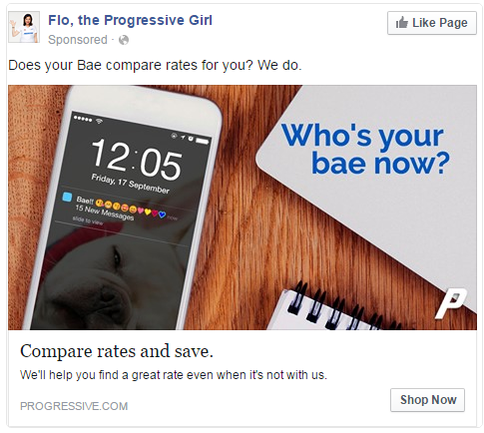 Eventually there will be a new term that replaces “bae,” which is already starting to seem outdated. Timing is important and you really need to know your audience and what’s relevant to speak like them. If you’re targeting millennials, you really should have a couple from that demographic on your team to consult with. Otherwise your efforts may come across as ill-timed or forced. Social media has made businesses more accessible. And as more companies use it to humanize their brands, the formal approach—which often comes off as dry or dull—has less of a place in today’s conversations. We even see it within certain advertisements and commercials when businesses try to act hip, street smart and young. Sometimes it can really fire back when you don’t know what you’re doing. When you can order a pizza by Tweeting an emoji, you know that the conversational landscape has changed. Social media is much more informal and unstructured than traditional business practices. The way we communicate has evolved, and businesses have to adapt as a result even with their social media publishing. Even if social media slang doesn’t align with your brand’s voice or objectives, try to maintain a friendly casual tone and treat social media like a conversation. Your customers ultimately want to connect with your business—whether or not you know what it means to be lit. 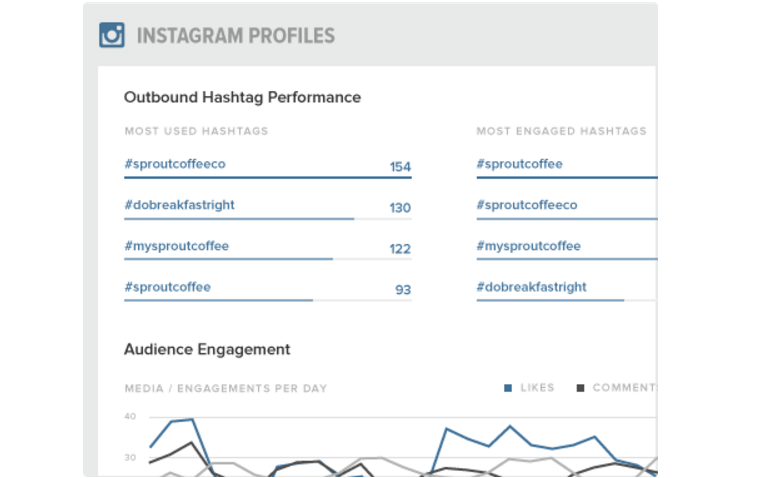 And make sure you’re not missing a single conversation with intuitive social media analytics tool from Sprout Social. With our social media tools, you can stay on top of the latest trends and hashtags that revolve around your business. See which hashtags or keywords are mostly associated with your brand so you can address issues or topics to your customer right away. You always want to be in the know when it comes to trends in your industry, and depending on your brand, the same could be said about social media slang. The most important thing is to make sure you feel natural doing it and maybe if you end up on a Twitter website poking fun at your use of “bae,” it could be time to switch directions with your social media strategy. Do you have any questions or “irl” examples to give us about social media slang? Feel free to comment below and share your thoughts!